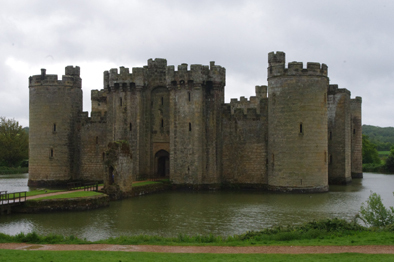 Bodium Castle is a moated castle in East Sussex and as such looks like a proper castle. It was yet another place I had never got around to visit. Thus, I managed to rectify that omission yesterday. The weather outlook was dismal and when I arrived torrential rain was sweeping across the castle and its surroundings so I sat in my car in the car park and ate my sandwiches wondering whether it would be best to give the effort of braving the elements a miss. But the weather outlook for the rest of the day was good and, no sooner had I finished eating, that it stopped raining and I was able to venture into this magnificent fortress. It dates from 1385 when it was built by soldier of fortune, Sir Richard Dallingridge. I am not going to regale you with its history. There are other sites on the web that can do a better job on that than I can do here. 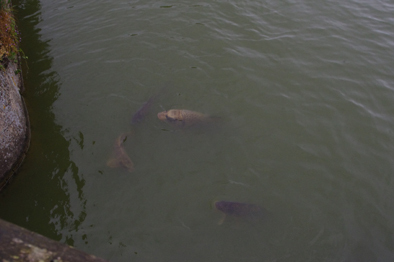 However, I can categorically state that the castle’s best feature is its moat which boasts some of the largest carp I have seen. In the unlikely event that the Monster Raving Loony Party won the British parliamentary election on the 7th of this month then its days as part of our heritage would have be numbered for it was stated in their manifesto that they intended to reduce the current economic deficit by selling all of our castles back to the French.